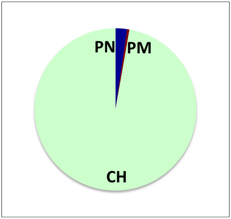 Vineyards and grape varieties: 220.5 hectares (544.9 acres), of which 97% Chardonnay, 2.3% Pinot Noir, and 0.5% Pinot Meunier. Google Maps view with the villages in the Côte des Blancs highlighted. The grand cru villages are shown in green, and the premier cru villages, including Bergères-lès-Vertus, in yellow. Comment: some of the communes on the map, in particular on the flatlands to the east, are not part of the Champagne appellation and therefore don’t have any village profiles. Bergères-lès-Vertus with vineyards in the background. Picture linked from Wikimedia Commons (photo Szeder László, 2007). Bergères-lès-Vertus is located to the southsoutheast of Épernay, at the southern outpost of the “genuine” Côte des Blancs slope. The village itself is located below the slope. The forest-clad Mont Aimé hill is located on the border between Bergères-lès-Vertus and Val-des-Marais, i.e., in the southern part of the commune. In the Medieval age there was a fortified castle on this hill. The Bergères-lès-Vertus commune covers 1828 hectares and has 588 inhabitants (as of 2012) referred to as bergeronnets and bergeronnettes. Hostellerie du Mont Aimé is an hotel in the village which also runs an ambitious restaurant. The vineyards in Bergères-lès-Vertus are mostly located on the southern part of the Côte des Blancs slope, and these are continuous with the vineyards in Vertus. A large part of these vineyards are eastsoutheast-facing, but at the end of the slope, the direction turns to south. Other than these, there are also vineyards in the southern part of the commune, on the eastern side of the Mont Aimé hill. These vineyards are approximately east-facing and are continuous with those in Val-des-Marais. Chardonnay dominates greatly in the vineyards. The current vineyard surface in the Bergères-lès-Vertus commune is 220.5 hectares (544.9 acres). There are 214.0 ha Chardonnay (97.0%), 5.1 ha Pinot Noir (2.3%), 1.0 ha Pinot Meunier (0.5%), and 0.4 ha others (0.2%). Numbers from CIVC, as of 2013. In 1997, the vineyard surface was 217 ha. There are 109 vineyard owners (exploitants) in the commune. Champagne houses that control vineyards in Bergères-lès-Vertus include Bollinger, Duval-Leroy, Moët & Chandon, and Piper Heidsieck. Vineyards on the southeastern side of the Mont Aimé. The photo is taken from the D9 road, approximately on the commune border between Val-des-Marais (to the left) and Bergères-lès-Vertus (to the right). The vineyards closest to the forest are located on the Bergères-lès-Vertus side. Picture linked from Wikimedia Commons (photo Szeder László, 2007). 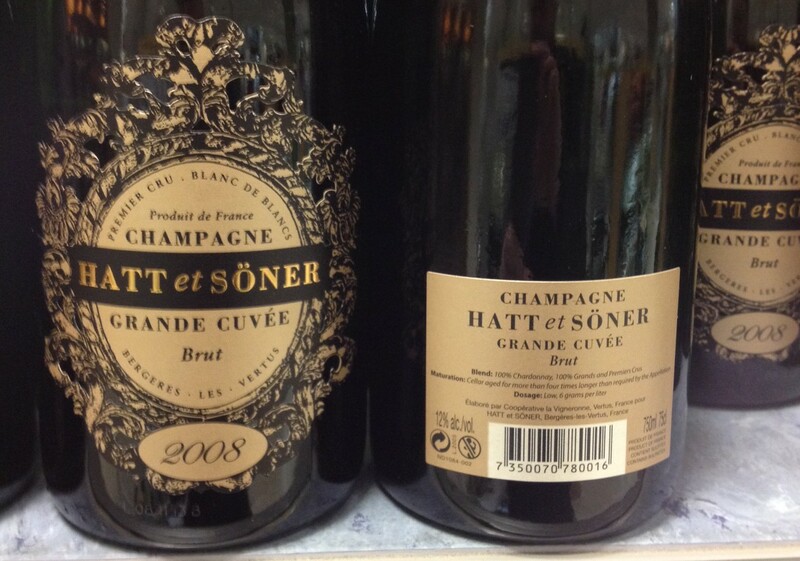 Hatt et Söner (ND, fomerly RC – see discussion below), a Swedish-owned Champagne house that sold their first bottles under this name in 2012. The current range (2015) includes a entry-level blanc de blancs called Grande Cuvée. At the launch in 2012, it was non-vintage, but in early 2014 it changed into a vintage Champagne, then the 2008 vintage. The current vintage at the end of 2015 is the 2009. Other than the regular Brut version there is also an Extra Brut. There is also a rosé that has remained non-vintage, and which in late 2015 is said to be composed of 90% Chardonnay and 10% Pinot Noir, from the 2009 and 2010 vintages. (The rosén is today the only non-vintage Champagne of their range.) The prestige Champagne is called Le Grand-Père and is a blanc de blancs launched in 2012 in the 2004 vintage. The vintages that have followed are 2005 and 2006 (the current vintage in late 2015, the grape origin is 80% Oger and 20% Bergères-lès-Vertus). There is also an Oger which is a blanc de blancs not generally available, only by invitation. The current vintage in late 2015 is the 2005. They also have an activity called “Personal Vintage” where customers can buy the possibility to influence the style of Champagnes produced for them. Overall, my impression is that their entry level (Grande Cuvée) is quite OK, but that their “prestige” so far not has been at the level you should expect. However, I’m willing to revise this view if my impression change. One reason I point this out is that Hatt et Söner still are in a build-up phase, and in a few years they aim at starting to sell Champagnes produced by themselves. Those sold so far have been produced by Coopérative la Vigneronne in Vertus. Initially (2012) they sold under RC status (in similarity to François Vallois), but some time later (in 2013 or 2014), the labels instead read ND. The thought is apparently to go for NM status in the future, i.e., to sell Champagne produced by themselves but where bought-in grapes or must can be included. It will be interesting to follow where this leads to. Their idea is to only produce vintage-dated Champagnes (apparently with the exception of the rosé) without malolactic fermentation. And the name? “Hatt” is Swedish for hat, “söner” is Swedish for sons, but “et” is French for and, so the name corresponds to “Hat and Sons”, and would be “Chapeau et Fils” in French. When marketing themselves in Swedish (and they definitely do, with a bit of a focus on non-traditional channels), they focus on their Swedish connection. They don’t sell exclusively in Sweden though. Since the late 1970s, the Ruscon family was a major customer for the Champagnes of François Vallois in Bergères-lès-Vertus (see below). In 2006, they found out that François Vallois expected the business to be closed down when he retired, since none of the children were interested in taking over. The Ruscons thought this was a shame, so discussions of buying partly or in whole were initiated at this time. The first small purchase happened in 2008. In the beginning, Hatt et Söner was said to be a progressive buy-out of François Vallois. They have later said that they became majority owners in 2011, using external venture capital. The first bottles where sold in 2012, and there could be little doubt that their focus was on selling in Sweden and to attempt to use various Swedish connections. The name comes from the hat factory that the family formerly ran in France. (Another branch later ran a brewery.) The Ruscon which is the face of the company is Kristofer Ruscon, who has a Swedish mother. Apparently they had first considered calling themselves Hatt et Fils and were supposed to have delivered some bottles with that name, but due to the risk of confusion with two producers called Hatté et Fils (Bernard Hatté et Fils is located in Verzenay and had a Swedish importer), they ended up choosing Hatt et Söner. The prestige Champagne, Le Grand-Père (“the grandfather”), is so named because it was Kristofer Ruscon’s grandfather who was the Ruscon who started to buy Champagnes from François Vallois. The plan is now that the daughter of François Vallois, Céline Vallois, will take over as winemaker in 2021. For the record, they received some less than positive reviews from Swedish wine bloggers in 2012, when we had our first encounters with their Champagnes and their marketing. I never translated the two blog posts I’ve previously written about them (in late 2012 and early 2014), since those post only seemed relevant to the Swedish market at the time. I’ve tried to keep this profile “fair and balanced”, but its length and the way it’s written may come across as odd unless you’re familiar with this background. Front and back label of a 2008 Grande Cuvée from Hatt et Söner, photographed in 2014. Denis Champion (RC), often written Champion Denis on the label. Has 7.2 ha of vineyards, of which 5.5 ha in Bergères-lès-Vertus. The range includes two vintage Champagnes: Cuvée Justine which is a blend of Chardonnay, Pinot Meunier, and Pinot Noir, and Grande Réserve. Some Champagnes are sold under the brand Champion-Rifflard, and that range includes a vintage blanc de blancs. Yves Jacopin (RC), has 4 ha of vineyards with 95% Chardonnay and 5% Pinot Noir, and an annual production of 30 000 bottles. Has two vintage Champagnes, where one is called Réserve Blanc de Blancs and the other Cuvée Spéciale. Naveau (RC), the vintage Champagne of which is called Rhapsodie and is a blanc de blancs. Perrot-Batteux & Filles (RC), has 5 ha of vineyards with 95% Chardonnay and 5% Pinot Noir. Has a vintage Champagne that is a blanc de blancs. Poirot & Fils (RM, alternativ webbplats), the vintage Champagne of which is called Cuvée Prestige and is a blanc de blancs. Serge Ragot Gallois (RC) used to be located in Bergères-lès-Vertus but is now located in Athis (to the east of Oiry) under the name Serge Gallois. Vigier-Perrot (RM), has 2.6 ha of vineyards and the range includes an oak barrel-vinified Champagne. Cooperative Vinicole du Mont Aimé is a cooperative in Bergères-lès-Vertus that is a member of the major cooperative Union Champagne in Avize, and which has 111 members with a total of 83 ha. Of the grapes that are delivered to this cooperative, 10% go to De Saint Gall (the brand of Union Champagne for their own Champagnes), 54% to major Champagne houses, and 36% is kept by members to be sold under their own name. This cooperative doesn’t seem to have a brand of its own. The cooperative was founded in 1952 by a group of vine-growers in Bergères-lès-Vertus, Coligny (Val-des-Marais) and Vert-la-Gravelle (Vert-Toulon) with a total of 27 ha of vineyards that planned to purchase a common wine press. In 1967, the cooperative joined Union Champagne. This meant that some of the members had to switch to being members of Les Coteaux de Champagne in Oger, which is the cooperative within Union Champagne handling grapes from villages that were score below 95% on the échelle des crus, while the Mont Aimé cooperative turned into one for members having premier cru vineyards. In 1987, cellar space of their own was added. Website of the Bergères-lès-Vertus commune. List of local companies, including Champagne producers. UMC’s new village profile of Bergères-lès-Vertus. Vineyard map of Bergères-lès-Vertus at weinlagen.info. This entry was posted in Champagne villages and tagged Bergères-lès-Vertus. Bookmark the permalink.